I don't know about you, but I have been doing some serious travel day dreaming recently. If only, it were as easy as picking up sticks and sailing off to some remote island... Instead I have worked my way through January with writing, books, tea and an ongoing supply of mini eggs. The book that kept me company through the last week of January was Destination Thailand by blogger and newly published author Katy Colins. I have been a fan of Katy's blog (Not Wed or Dead) for some time and have been thrilled to see her success unfold over the past year. While I don't read a lot of what some might call 'chick lit', I was keen to give Katy's debut novel a try and I was not disappointed. Based on her own experience Destination Thailand tells the story of Georgia, a woman in her late twenties who has just been dumped by her fiancee mere weeks before their expensive wedding. Left feeling bruised and uncertain of her future, Georgia decides to go backpacking in Thailand. I think Katy's greatest strength as a writer is her distinctly British humour; this is certainly a book that had me chuckling. The characters Georgia meets while on her travels are vibrant and realistic. I'm sure those who have gone backpacking (or even just stayed in hostels) will appreciate the various weird and often wonderful people one encounters. Georgia is a highly likable protagonist, plagued by many insecurities which are highly relatable for young women. 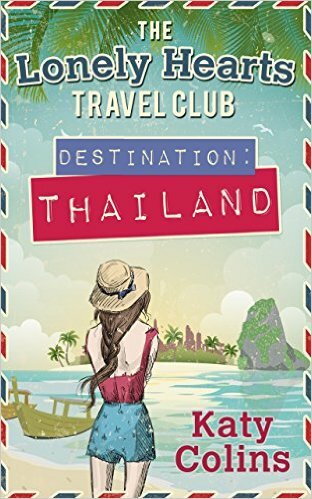 Destination Thailand is an easy read which offers the opportunity to day-dream about far off places and perhaps even reevaluate your own priorities. I look forward to reading more in the Lonely Hearts Travel Club series. Here's to embracing our sense of adventure!